Zombie Apocalypse. Have you heard of this before? I’m sure you did if you love watching a lot of horror movies coming out of Hollywood. There’s plenty of them just in this single plot. To name a few, I’d go with Dawn of the Dead, Shaun of the Dead, 28 Days Later, 28 Weeks Later, Night of the Living Dead, Devil’s Playground, Resident Evil franchise, Zombieland and so on. After watching so many movies set in post-apocalypse country showing how a group of survivors make their way through the undead, I was actually supposed to be tired of it. These surely will apply in case of a real zombie apocalypse. But I wasn’t. Last night I watched yet another zombie apocalypse movie that was made in German called Siege of the Dead (English subtitles helped me understand the story thanks to Subscene). I enjoyed it. It was the only movie that shows survivors not using any kind of weapons. Anyway, I’m actually addicted to this plot. Zombie Apocalypse fascinates me. I even started playing a similar game called Left 4 Dead and finished it within 4-5 hours. I have an exam next month that’s why I’m not taking up Left 4 Dead 2 yet. But I’ll play it anyway. I don’t exactly know why I find myself addicted to zombie apocalypse. I’d hate to see my country turning into full of undead lurking around trying to bite hard and turn me into one of them. Still I just can’t get the idea out of my head. How would it really feel to be in a city where everyone else is undead? One honest thing about me, I don’t really think I’ll make it if I happen to be into one dead city. But I’m wondering if making my face look like zombies will help me get through them as seen in the zombieland. If a zombie apocalypse happens, which I think can happen because all it takes is a deadly virus/brain infection, I’ll definitely try to cheat on the undead. If you haven’t heard the word zombie apocalypse, or if you haven’t seen any of these movies, I recommend you start watching some. At least watch the ones I named above. Then tell me do you find yourself addicted to zombie apocalypse like me? 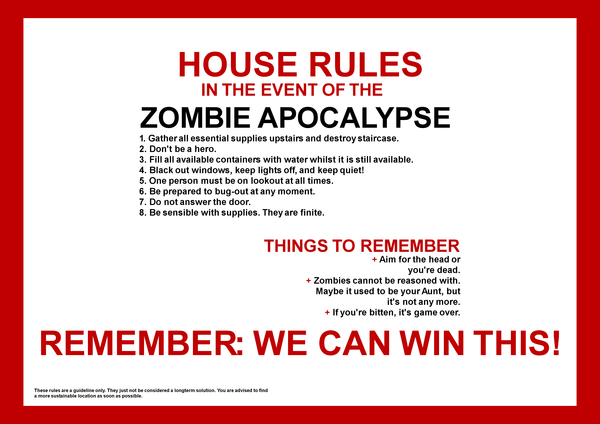 Read: 5 Scientific Reasons a Zombie Apocalypse could actually happen. Always befuzzled me zombie films. I have my plan set up in case of an invasion. Grab gun, cricket bat and run to the nearest coast, jump on boat. On the way of you can pick up seeds and soil then you can set up your own fresh food garden on the boat. Sail until you find uninhabited island. Invent a way to make coconut beer. Sorted. That’s a good idea. I see you got a plan laid out. 😀 But if it happens in Bangladesh, you can’t go with that plan. And one question: In that image it’s said that one should gather stuff upstairs and destroy the stairs. But wouldn’t the house collapse if you’d destroy the stairs :-S? Coincidentally, I have been downloading The Walking Dead series 1 for past few days via torrent. 😀 I came to know about this from its director’s IMDb page. I started downloading it because three of the same director’s other movies include The Mist, The Green Mile and The Shawshank Redemption, which are breathtaking movies. So I readily knew The Walking Dead had to be great. Now off to reading your post. Yeah I get that but usually the staircase supports part of the upper floor so I think it’s a really bad idea :P.
That could actually be real. It’s not ghost. It’s a result of infection. Have you seen “Super eight”? They liked zombie apocalyses too! No, is it a movie?